I've been having high jitter & packet loss at various times and at various degrees of severity. I play fortnite on pc and theres an option to show network debug stats. 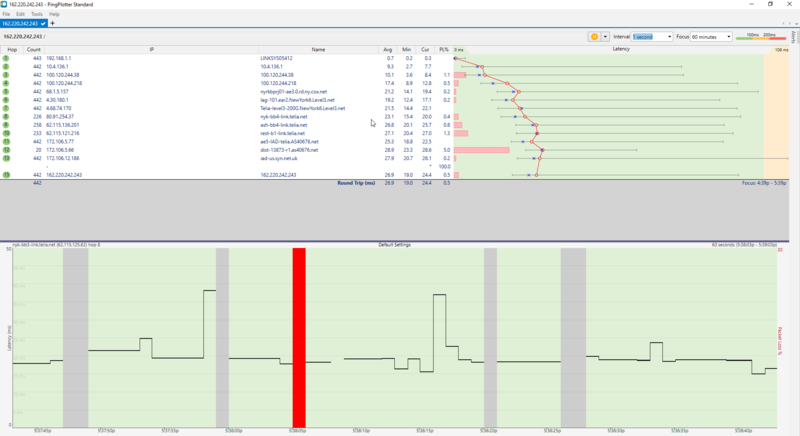 Almost all of the time I see between 1% and 4% packet loss and there extended periods during the night where I will see between 10% and 20% packet loss on my upstream. At these moments when I see this packet loss I'll use the cox speedtest and I'll see that I have jitter, around 100ms. I've had a couple of techs come out and I think we've ruled out anything I have control over, my routers fine, modem, ethernet, etc. The last tech I had come out was a more senior tech I think, and he found there was interference going on in my lines coming from the outside. He also said there was a amatuer radio station near my house that could be causing interference. http://www.arrl.org/visit-us. They're about 1-2 streets away from my house. Anyways, the tech was telling me about how for upstream traffic theres multiple channels working, and they are working at different frequencies. I think he said theres 4 total and 2 are working at 60mhz and the other 2 are working at 30mhz(maybe 32mhz). Although I am not positive on those numbers I just remember one started with a 3 and the other with a 6. He also said that the channels working on 30 mhz are more subject to outside noise and that Cox was doing an initiative to get all of CT to have only channels that use 60 mhz by July 11th. Does anyone have any information on this change? I am still seeing bad packet loss and I am wondering if the change has already happened in my area, or if I can find out exactly when the change is happening so I can better monitor my internet on the day of the change. let me know if you ever find a fix brother ! I have this issue as well. I don't stream but I play fornite on xbox and rocket league on pc. On fortnite the packet loss varies from 1-60% (Been upwards of 70%). I've had techs out 4-5 times and each time they say something different. Its very frustrating I can't find a fix as I've looked it up everywhere. And when I call saying I have packet loss It looks fine on coxs end. An answer would be much appreciated. That is a lot of packet loss that you are seeing. Have you attempted to hard wire your Xbox to play Fortnite to see if you get the same issues there. Please also try your PC at the modem as well. Let us know what you get there.